A memorial to pioneer and trail maker Daniel Boone stands at Summit Street in Winston-Salem. The monument is a large granite arrowhead; in the center of the arrowhead is a bronze tablet with a bas-relief image of Boone, seated with his gun and accompanied by his dog above a map of roads leading west and northwest from Winston-Salem. Below the map is an inscription in memory of Boone, a facsimile of Boone’s signature and the monument committee members. The history of this marker began over 13 years prior to its dedication when J. Hampton Rich of Winston-Salem formed the Boone Trail Highway and Memorial Association to promote improving the road and highway system in western North Carolina. A part of his campaign to drum up support was to place a series of commemorative highway markers featuring the likeness of Daniel Boone. 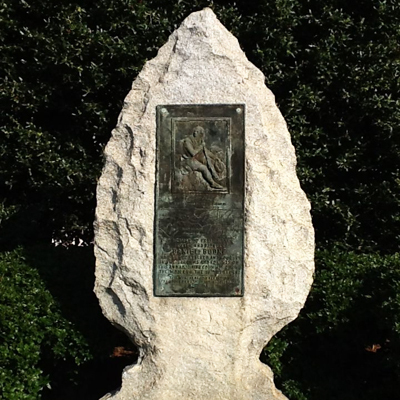 The tablet mounted to the arrowhead in Winston-Salem was the first Rich ever had produced and is one of a kind. It is considered to be the “Mother Marker” for the hundreds of others that followed yet it was not placed and dedicated until 11 years after it was cast and 10 years after the first Boone Highway marker in North Carolina was dedicated at East Bend in Yadkin County. The East Bend tablet and all that followed were made of steel and only held the depiction of Boone and his dog. In place of the longer inscription wording was added that the metal was salvaged from the U.S.S. Maine. The dedication date for this tablet was first announced for the fall of 1915 over a year before it was actually received from the foundry. Money appears to be the reason for the delay. It was even held at the train depot when it arrived until more funds were raised to pay the freight. The original site would have been at Grace Court a few blocks from the current location where a piece of granite said to be the largest one piece monument in North Carolina had been delivered in 1915 and awaited the tablet. The memorial was never completed and in August 1917 the city of Winston-Salem had the granite block broken up and removed. J. Hampton Rich retained the “Mother tablet” and used it to promote his plan to commemorate Daniel Boone which by 1917 had expanded far beyond the borders of North Carolina. It was finally given a home with its dedication in October 1927. This Boone Highway marker was numbered 4 by Everett G. Marshall. His interest and research of the markers led to the book, Rich Man, Daniel Boone. The numbering system was simply the order in which he found or became aware of a marker. Preceding the monument dedication, the Boy Scouts held a field event in Hanes Park and took part in a variety of competitive activities, including first aid and fire building. Troop 11 from the Children's Home won the competition. When the monument was dedicated, two Wiley School students spoke on the life of Daniel Boone. A group of students carried flaming torches to illuminate the evening ceremony. Cast at a foundry in Baltimore, Maryland. The marker is located at the intersection of Reynolda Road and West End Blvd, on the left when traveling south on Reynolda Road, in Winston-Salem, NC. It stands at the east end of Hanes Park. The memorial marker is surrounded by evergreen bushes and large shady trees. Daniel Boone’s birthday is periodically celebrated by the local Boy Scouts.